In our Engineering centers in Neukirch (Germany), Lamprechtshausen (Austria) and Hangzhou (China) 50 engineers are developing application specific technologies, which are protected worldwide by patents. High quality manufacturing and injection molding are of the greatest importance for the products we develop. For this reason all our products are manufactured exclusively in our own plants. From our demand for high quality standards we derived our own core competence in this field and expanded our business within the sector. Our range of "Engineering" services comprises highly automated processes for injection molding, tool making, coil winding, mirror-imaged welding, brazing of steel and copper, laser welding and routine product testing. We offer the service area Manufacturing & Injection Molding at our sites in Lamprechtshausen (Austria), Tychy (Poland) and Wuhu (China) from where we can serve customers worldwide. Our plants in Europe and Asia are certified according to ISO 9001, our site in Poland also has the environmental certification ISO 14001. In our plant in Tychy we are also producing high quality plastic parts for the automotive industry according to TS 16949. We make it our task to develop and manufacture products which meet today's environmental requirements and the future. An example is our aluminium heat exchanger. It is 100% recyclable, reduces energy consumption up to 30% and bisects the consumption of polluting HFC and HCFC refrigerants. A further example is our BLDC pump for the dishwasher market, which allows our customers to offer appliances of the highest energy efficiency ratings in the industry. You see, our aim is always to offer components and solutions with the highest energy efficiency, low consumption of resources and optimized comfort (eg. reduced noise) as a positive contribution to our environment. 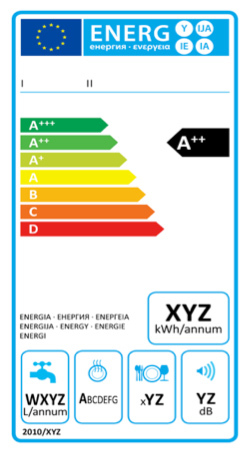 For cooling devices, freezers, washing machines and dishwashers within the EU the new energy label as proof for energy efficiency with the new classes A+, A++ and A+++ is obligatory since end of 2011, for wash dryers since May 2013.